Bilbao is the main city of the autonomous Basque Country, in the province of Biscay in northern Spain. The North of the Iberian Peninsula and the Basque Country in particular, is becoming increasingly popular as a roadtrip holiday destination. The roads in northern Spain are many and safe, the landscapes breathtaking and diversified, the historic heritage rich and unspoiled by mass tourism. Last but not least, the car hire in Spain is widely available and relatively inexpensive, when booked in advance, preferably via internet. Also, the neighbouring France, or even Portugal are easily accessible by road from the Basque Country and many rental companies allow cross border travel. Check in the "Rate details" of your offer to which countries you can travel in your Spanish hire car. Treat yourself with a larger rental vehicle with a powerful engine, when renting a car in Bilbao. The comfort of driving in the hilly surroundings of the Basque Country will be uncomparable to the one offered by a smaller car, with equally smaller engine. Bilbo, in Basque language, is a great example of a city that has found a way to reinvent itself, adapting to the changing reality. From a tiny settlement founded in the 14th century in the Biscay Bay, Bilbao grew into an important commercial port of the region. Later on, with the extraction of rich iron deposits in the area, Bilbao became Spain´s second major industrial centre. The heavy industrialization in the 18th century enriched the city and turned the Bilbao metropolitan area into one of the most populous in Spain, but did little favor to the Bilbao's aesthetic side. Fiat 500L - cheap family car for five to rent in Bilbao Airport, Spain. © Photo: Find-cheap-car-hire.co.uk. The slowing economy and subsequent de-industrialization forced Bilbao to look for new ways to prosperity. Tourism, apart from services, was the obvious bet. The natural beauty of northern Spain, already attracting many visitors, allied with the city´s urbanistic, carefully executed, renewal. The old historic districts were revitalized, the newer parts modernized and new additions to the city plan, as for instance the unique Guggenheim Museum, gave Bilbao´s emerging tourism sector the necessary impulse. See the map of Bilbao city centre. Come and visit Bilbao, the city of modern, avant-garde architecture and the witness to Spain´s grandiose past. Take a roadtrip in the breathtaking scenery of Biscay and get to know the still-a-little-misterious Basque Country. The main gateway to the Basque Country is Bilbao Airport - BIO, located 6 miles north of Bilbao city centre. Designed by Santiago Calatrava, Bilbao Airport is probably one of the most emblematic airports in Europe and a tourist attraction itself. It will surely give you a taste of many architectonical wonders to discover in Bilbao. Inaugurated in 2000, in response to the growing volume of passenger traffic to the Basque Country, the new Bilbao Airport terminal left few indifferent. Praised for some for its original design and concern with aesthetics, the terminal was heavily criticizes for others for being somewhat impractical. The terminal, also known as “La Paloma” (The Dove) consists of two symmetrical wings and a narrow, pointy structure in between, resembling a bird in flight. An unique viewing gallery in a 300 m glass corridor allows a spectacular view of the entire airfield. The design of Bilbao Airport is modern, airy, luminous and minimalistic, with white concrete and glass as the dominant materials. The extravagant and very defined design of the terminal leaves, though, little or no possibilities for future development, which might be needed as the tourism industry is booming in Bilbao. Also, the lack of arrivals hall, where the travelers had to step directly outside after the custom clearance, was inconvenient to the point that extension works were needed. A selection of passengers facilities, as restaurants, cafes, duty-free shops, is available at the Bilbao Airport. In the new arrivals area you will find tourist information and car rental services. Car hire is called alquiler de coches in Spanish. Most of the main car hire companies offer their services at Bilbao Airport: Avis Rent-A-Car, Europcar, Hertz, Sixt and National-Atesa. Cheap car hire in Bilbao Airport can often be found by comparing offers with lesser known Spanish companies which deliver hire cars to the airport in Bilbao by appointment with the customer. It is always advisable to use an online search engine to compare rates from different car hire suppliers in order to find the best rental offer when planning your holiday in the Basque Country. Outside the high tourist season, for instance in September, when the weather is still very pleasant in northern Spain, you can expect prices starting from around £70-90 for a 7 days Spain hire car of an economy class/supermini vehicle (Ford Fiesta, VW Polo, Seat Ibiza or similar) at Bilbao Airport. In high season, especially in July-August, Bilbao car hire can be considerably more expensive. If travelling 4-5 people in a group or as a family, the intermediate or large middle class hire car type in Bilbao is often the best offer from approx. £220 in high season. Beware of variations in fuel policies with Spanish car rental companies. Often, you will be asked to pay for a full tank of fuel at collection of your hire car in Spain. When returning the vehicle, with quite a number of companies no refund of unused fuel is given ("Pick-up full/return empty"). Important: If you car hire contract states "Pick-up full/return full", always remember to fill the tank before handing it back. Should you fail to do so, the car hire company will charge you for the fuel at slightly over the going rate and apply a fee for the service. Therefore, always read the rate details carefully and pay special attention to fuel policy when hiring a car in northern Spain. The prestige of the new, worldly recognized terminal of Bilbao attracts more and more airlines. As a result, Bilbao Airport has an exceptionally good selection of domestic destinations in Spain, as well as the European ones, most of them low-cost. Cheap flights UK – Bilbao are available from Easyjet (London-Stansted and Manchester) and Vueling (London-Heathrow). The domestic destinations from Bilbao Airport include Madrid, Barcelona, Seville, Valencia, Santiago de Compostela, Vigo and Malaga, as well as the popular holiday resorts of the Canary Islands: Gran Canaria, Palma de Mallorca and Ibiza, amongst others. In attempt to rehabilitate the decrepit post-industrial areas of Bilbao and to stimulate the emerging tourism sector in the Basque Country, local government proposed to the Guggenheim Foundation a creation of a contemporary art museum. With the design by internationally acclaimed architect Frank Gehry and nearly 100 million dollars Basque investment, an unique, ultra-modern building was conceived, drawing the world´s attention to Bilbao, even before the museum´s inauguration in 1997. The extravagant stone, glass and titanium structure on the bank of the Nervion River hosts, in its nineteen separate galleries, works and installations of contemporary artists as well as thematic exhibitions. Names as Willem de Kooning, mark Rothko, Jenny Holzer or Richard Serra, just to mention a few, are associated to the Bilbao Guggenheim Museum's permanent exhibition. See the current exhibition programme in Guggenheim Museum. The museum received over 4 million visitors in the first three years of functioning and has been a place of pilgrimage for art and architecture lovers ever since. The economic boost the museum gave to Bilbao's tourist industry surpassed all expectations. Today´s Bilbao is known mostly for its many emblematic examples of avant-gard architecture. The Guggenheim Museum is not the only icon of modern Bilbao. Venues such as Euskalduna Conference Centre or Bilbao Exhibition Centre make of Bilbao a very interesting destination for business tourism. The historic heritage of Bilbao was not forgotten, however. You will enjoy, when traveling to the Basque Country, a visit to the beautifully restored Bilbao's Casco Viejo, the city´s Old Quarter, the Santiago Cathedral or the Basilica de Begona. 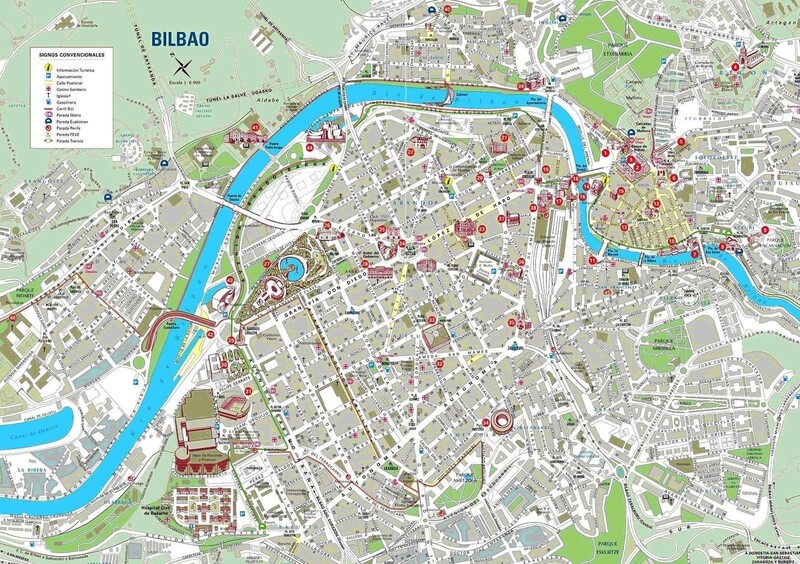 See the map of Casco Viejo in Bilbao. Take a stroll on some of Bilbao's bridges. The hanging bridge, Puente de Vizkaya (or Puente Colgante) is a monument to the industrial past of the city. The views of Bilbao from the walking platform of the bridge, hanging 50 meters above the ground and the river, are breathtaking. Also worth seeing is the ultra-modern Zubizuri Bridge, designed, again, by Santiago Calatrava. The “White Bridge”, as it is also called, of exclusive pedestrian use leads to the Guggenheim Museum. The layout of the city, developed on the river banks, with many bridges connecting both sides, make driving in Bilbao challenging, at times. As in any big city with large peripheral area, the volume of traffic increases during the rush hours, when people drive to and from the city centre. Also, many of Bilbao´s streets are very steep and one-way ones. You cannot rely 100% on the driving map of Bilbao, as there will be manny traffic cuts, due to the constraction works, frequent in the city. If you are in Bilbao for sightseeings, you may want to consider leaving your rental vehicle parked safely in one of many hotel parkings near to Plaza Moyua and get comfortably on foot to the most of Bilbao's tourist attractions. VW Touran – sometimes available from £ 250 per week Spain car hire early booking / low season © Photo: Find-cheap-car-hire.co.uk. Bilbao Airport is located within a good network of important road links that can give you a quick access to many cities in Spain. By AP-68, to the south from Bilbao you can easily get to Basque Country's capital Vitoria-Gasteiz and by A-8 to the east, you will reach San Sebastian, the European Capital of Culture in 2014 and place well worth a day trip from Bilbao. The A-8, along the coast is also the best way to travel by car to the Asturias and Galicia regions in northwestern Spain. The Spanish border is mere 71 mi (115 km) away from Bilbao and the road distance to the Portuguese border is of 309 mi (498 km). See map of motorways in the Basque Country and the resto of Spain here. Alquiler de coches Cartrawler. Find the best car hire offer for a roadtrip in the beautiful scenery of the Basque Country. Get to know Bilbao and its splendid Guggenheim Museum. With Cartrawler Spain compare rates from Avis, Hertz, Sixt, Europcar or National Atesa at the "La Paloma" Bilbao Airport.